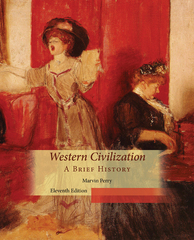 Western Civilization, A Brief History 11 Edition WESTERN CIVILIZATION: A BRIEF HISTORY, Eleventh Edition, offers a concise introduction to political, cultural, and intellectual history. Easy to read and updated with recent scholarship, the Eleventh Edition retains many popular features, including comparative timelines, full-color art essays, and primary source boxes in each chapter. New technology resources (available separately), including MindTap--featuring the interactive MindTap Reader eBook and a variety of web apps--make learning about history more engaging.